Visual: 11” x 12” approx. Description: A Pair of Artisanaware Pillow Covers Which Evoke a Feeling of Olde World Europe. 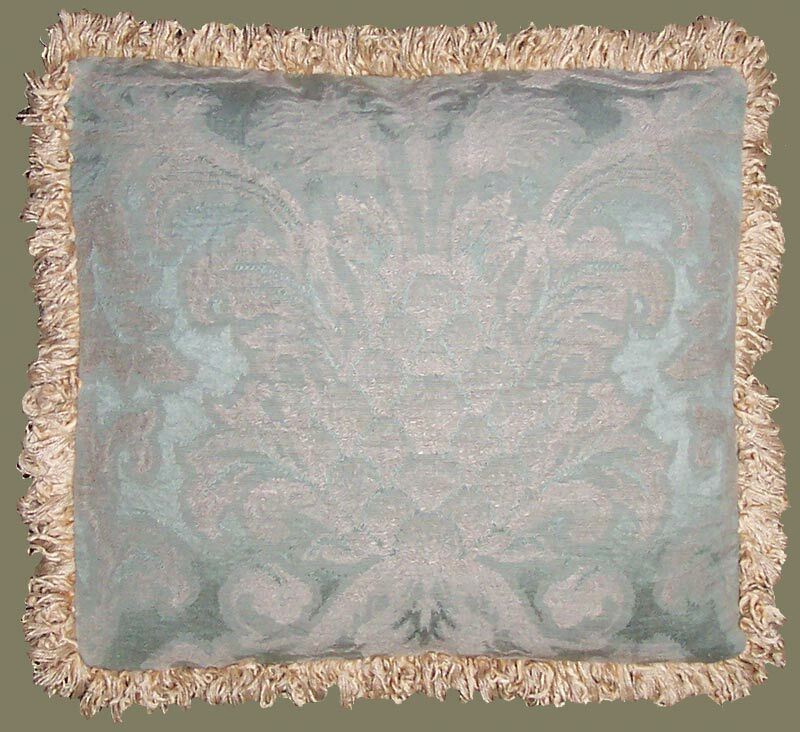 Made of Reclaimed Vintage Damask Fabric in Soft, Muted Aqua, Almost a Robins Egg Blue, but with a Dash More Green. The Pattern Being High Lighted in a Light Wheat Color. The Fabric has Been Shrunken to Produced a Nice Crinkled Texture to this Vintage Fabric which was Rescued and Reclaimed from the Back of an Old Upholstered Settee. The Textured Silk Pillow Backing Fabric is Designer Fabric Remnant. Looped Fringe in a Variegated Wheat Color. Small Decorative Pillow Covers With an Olde World Flavor are Ideal Accents in a Pair of Chairs, or Grouped with the Larger Companion Pillow Offered. Zippered. Please Inquire About Custom Feather/Down Pillow Inserts.